A note on color: All monitors differ, and the colors in the printed catalog differ, and my digital camera adds another source of variability. However, my monitor and my printed catalog are in decent agreement, and I have found that in real life, the yarn is in general lighter and brighter than the monitor/catalog. Some colors are very close to what’s in the catalog, and others (rhubarb) couldn’t have been further off. 1. Wool of the Andes: very nice basic wool. Yardage same as Peruvian Collection Wool from elann (110 yards per 50 g skein). Not super scratchy, would be good for outer garments, hats, mittens. Pretty tightly spun, would be good for cable work, open work. No halo. 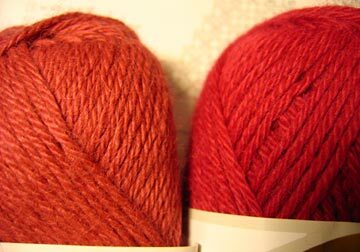 I only got one skein, the color is cranberry. 2. Andean Silk: disappointment. Something was off in making this yarn. Although the yarn is very soft, it seems scratchy to me. I do not think I would be able to wear it next to my skin. It is typical ‘alpaca’, and has those long, straight fibers sticking out, giving the yarn a halo (and probably a tendency to shed a little bit). The silk gives the yarn a nice sheen, and the individual plies of the yarn are clearly distinguishable because they are not spun together tightly. It is not as stretchy as wool yarns, and I think for that reason it might not make a great sweater, or even hat. On the other hand, I could see this yarn used for a scarf or a shawl. I think seeing the individual plies would distract from cable and open work, and I would bet the yarn would split easily, making it not the best candidate for such knitting anyway. Yardage is comparable to Adrienne Vittadini’s Martina (96 yards in 50 g for KnitPicks, 109 yards in 50 g for Martina), although this yarn is much cheaper. The colors I got were: (a) barn red, (b) slate, (c) bluebell, (d) sangria, and (e) cream. 3. Elegance: Remarkably similar to Andean Silk, except this yarn is super soft and doesn’t seem scratchy (I’ll have to swatch to be sure). It has a halo, but none of the long alpaca fibers sticking out like the Andean Silk (or elann’s Peruvian Collection Alpaca, for that matter). Again, doesn’t seem as stretchy as wool (hello, it’s alpaca, of course). 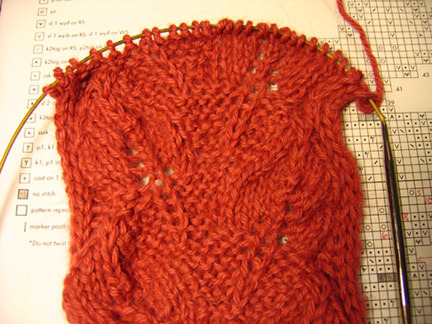 Has a great sheen to it, individual plies are distinguishable, may not be the best for cable and lace work. The softest yarn of all the ones I ordered. Yardage same as elann’s Peruvian Collection Alpaca, but this stuff is definitely softer and doesn’t shed as much. Yardage much better than Debbie Bliss Baby Alpaca Silk, but I don’t know how it compares in ‘softness.’ The colors I ordered were (a) barn red, (b) wild rose, and (c) ash. Ash was my favorite color. Update! I’ve swatched this bad boy. Yummy and delicious. The silk content of the yarn definitely makes itself known – the swatch is smooth and slinky. Stitches are easily seen, as are the individual plies, even though there is a soft halo. Despite not having wool content, the fabric seems to be quite stretchy. I rubbed the fabric against each other (as hard as I would were I trying to get a stain out of cotton) and noticed some fuzzing. Uhm, I’m not sure if it was more or less than normal (?). Well, it didn’t fall apart, how’s that? 🙂 My gauge on US 5 needles is 23 1/3 sts per 4 inches, and on US 6, it’s 21 sts per 4 inches. 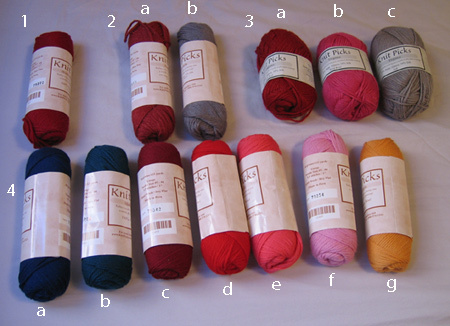 Right in line with what KnitPicks predicts. Yes, this yarn is wearable against bare skin – I tucked the swatch under my shirt and was irritated to the same extent wool irritates my skin, which means for everyone else it will be fine. I wound the ball on my wool winder, and the yarn seems completely free of defects and irregularities. 4. 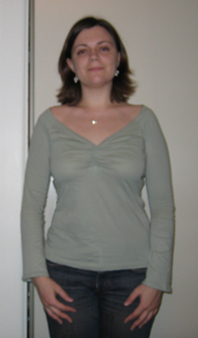 Merino style: love it! Feels very nice. I expect to be able to wear it next to my skin, but I have to knit up a swatch first to be sure. Pretty tightly spun, no halo, would be good for cables and open work. Very soft, springy, does not appear like it would split easily. 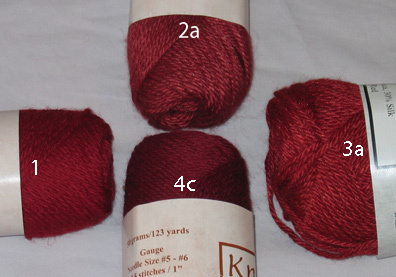 Yardage comparable to Patons Classic Merino Wool (50 g, 123 yards here versus 100 g, 223 yards for Patons). I got the following colors: (a) dusk, (b) storm, (c) hollyberry, (d) maple leaf, (e) rhubarb, (f) petal, and (g) harvest. Update! I’ve swatched this bad boy. And I’m in love with this yarn. Just an all around great yarn. Very soft, flexible, slides smoothly on needles. Very nice stitch definition, and no halo. I think it would be great for a sweater, and it’s definitely wearable against bare skin, determined the same way as Elegance. Oh! The end of the yarn that runs to the middle of the skein is gently tucked under the label – no more fishing for that end in the middle of the skein, only to pull out what seems like half of it! I did the rub test, just like with Elegance (I’m really quite vigorous, I have to “vigorously shake tubes” all the time at work), and I noticed some fuzzing and pilling. With Elegance, it was more of a fuzzing, here it’s more of a pilling. But, gosh, I hope I’m not that vigorous when I actually wear the sweaters! The swatch did not fall apart, that’s a good thing. My gauge on US 5 needles is 23 1/3 sts per 4 inches, and on US 6, it’s 22 1/3 sts per 4 inches. 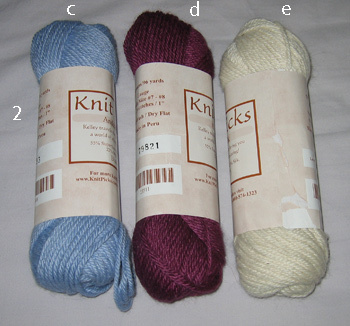 Right in line with what KnitPicks predicts. However, is there trouble in paradise? As I was swatching, I noticed that in two separate places within a few feet of each other, one of the yarn plies was torn! Gasp! So, after I was done with my swatch, I rewound the skein using my wool winder, and found no further problems. In fact, now I can testify that the color, yarn thickness, and tightness of spin are uniform throughout the majority of the skein. As I mentioned, Elegance didn’t have any defects, so I’m going to guess that this was just a small defect in this one skein. By the way, I love this ‘petal’ color! Too bad it nearly matches my skin tone :(. Conclusions: I might have a sensitivity to alpaca, just like to mohair, because I find it soft and itchy at the same time. The merino seems like a nice yarn for the price. Considering Elegance is only $1 more than Andean Silk, buy the Elegance. Rewind all yarn skeins and hanks before using them, to make sure there are no “surprises” hiding inside (I hope I’m not suggesting anything new here). 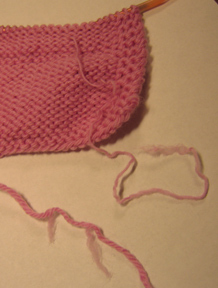 There is a wonderful word in Russian, ‘tricotage.’ The root is French: tricot means knit. 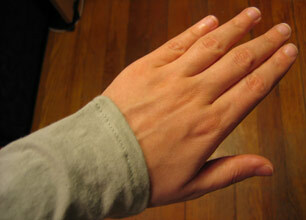 In Russian, ‘tricotage’ refers to a fine knit fabric, such as the stuff used to make t-shirts. More often than not, ‘tricotage’ is cotton, very stretchy, and your sewing machine’s worst nightmare. 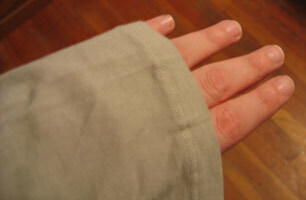 I bought a long-sleeved shirt made out of ‘tricotage’ some time ago. Although its sleeves were three inches too long (you can see that on the mannequin) and it had an awkward ribbon tie in the front, I really liked the way it fit, so I decided to keep it and do some alterations. Oh, and it was on sale, that helped matters :). My mom is a great seamstress, and my mom’s uncle is a professional tailor, so I’ve grown up around fabric chalk and taking measurements and fancy sewing machines. However, I haven’t used any of that equipment. Until now. Fabric chalk and brand new gingher scissors* in hand, I got to work. Sewing tricotage on a sewing machine is not trivial at all. 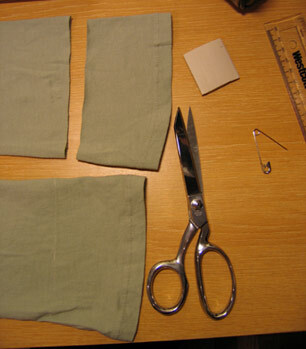 It’s very stretchy and it’s therefore very easy to pull it too much when feeding it into the sewing machine. 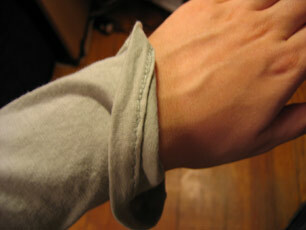 Plus, the sleeves of this tee are bell-shaped. Plus, I’ve used the sewing machine only once before (I still take out the manual to figure out how to thread it – yikes!). I will fully disclose that I had to baste the fabric into place and that it took me more than one try to be satisfied with the result, but I did it! Ahh, the length is much better. And here’s what it looks like on the inside – you can see the two rows of stitches: I made one small fold, then stitched, to secure the fraying, and then a bigger fold (followed by stitching) to make the edge. 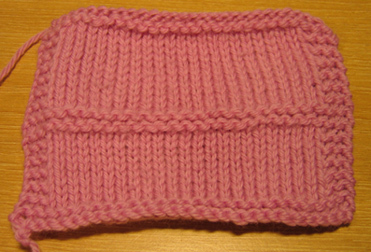 The first time I used a sewing machine it was to sew thin plastic to handknit fabric. And now tricotage. I really don’t take the easy way out, ever :). *The gingher scissors were a New Year’s gift to myself. I got tired of using Fiskars, especially considering my pair is blunt, blunt-ended, and meant for cutting paper. I couldn’t believe how sharp and smooth the ginghers were. I liked the full-metal construction and the feeling of weight in my hand. Wow. Talk about nice scissors! Through fluffa’s website I came across this Russian knitter’s website called Knit Your Own Karma. “Knitting Woman,” that’s what the owner of the website calls herself, has just completed a fabulous hooded pullover, and has included links to both pictures of it, and instructions. How is one supposed to knit this fabulousity? By knowing Russian, and translating the pattern, of course! My reading skills in Russian are questionable, at best, and my knowledge of knitting terms in Russian is non-existent, but I think with my mom’s help, we could figure it out. Ooo, ooo, is this another project? 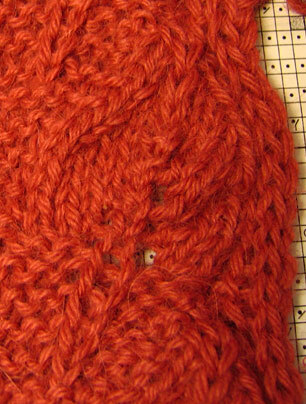 So far I have been able to ascertain the following: the tension is 12 sts and 15 rows/10 cm. This is bulky yarn, and the project would go quickly. Interestingly, the pattern calls for US 8 needles, and ‘Knitting Woman’ used US 7. So I guess it’s bulky yarn knit pretty tightly. In the US, yarn like this would be worked on US 10-11, I think. The pattern is written in one size – 42/44. I’m not sure what this means, because I’m 100 cm around the bust (is that a size 50? ), but also have European jackets which say 40 on the tag. Go figure! However, knowing the tension and that they ask to cast on 54 sts, this size will work for me! Interesting possibilities :). Maybe I’ll make it? Will someone wipe up my drool? 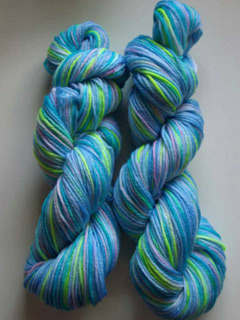 A friend from the about.com knitting forum posted this link to some absolutely gorgeous handpainted yarns. It’s hard to pick a favorite, but I’m quite enamored with Little Cayman. What’s your favorite? And, please, pass a hankie, I need to wipe up my drool. Now that grandma’s socks are done, but I’m still researching the yarn for my Adrienne Vittadini sweater, I’m working on another exciting project. I first spotted the Backyard Leaves scarf when I borrowed Scarf Style from the library. It didn’t make a big impression on me at the time. Then I saw a sample scarf knit up at Woolcott, a local yarn shop, and was very impressed with the intricate design. I requested the book again from the library, ordered some yarn, and got started on Sunday. The yarn I’m using is 100% alpaca from elann.com. It is sleek, slick, a little fuzzy, and unlike wool, not very stretchy. It reminds me of angora a lot, except not as itchy (I’m mildly allergic to angora). I picked out two colors, antique rose and raspberry, with hopes of keeping one and returning the other. However, I liked both colors so much that I decided to keep ’em both. On Sunday I asked some fellow knitters which one would suit me better, and the group voted ‘raspberry.’ So I went ahead and cast on with the antique rose because despite their vote I realized that’s the one I wanted to use :). Working with this yarn is wonderful. It is so soft and buttery. It has great stitch definition, more defined than wool, I’d say. 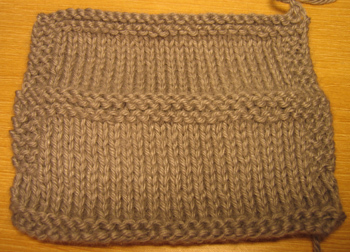 After working two repeats of the pattern, I think this alpaca will work well for the pattern. I think this will be an enjoyable project while I mull over yarn selection for the sweater :).